It is 3:00 a.m. and I am rapidly approaching the point of diminishing returns, defined as the point at which you spend more time reading random stuff than you do working. We've all been there. Don't deny it! 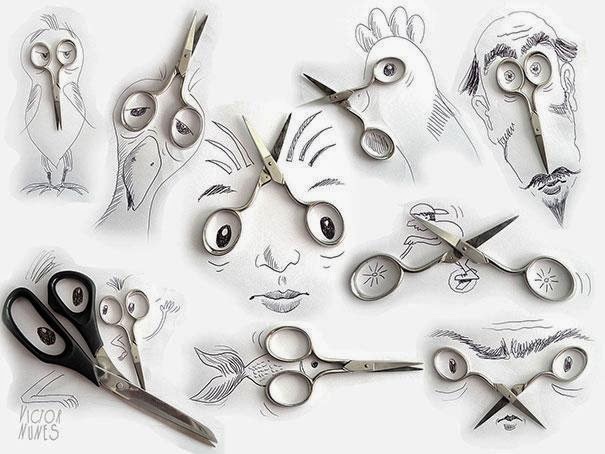 And so, it is at a time like this that Victor Nunes' whimsical artwork speaks to me. This is pretty much where I'm at tonight, and quite possibly most days, just under the surface [see exhibit A in top right corner]. Now, tell me that this isn't genius and that it doesn't rock your world at any hour of the day. 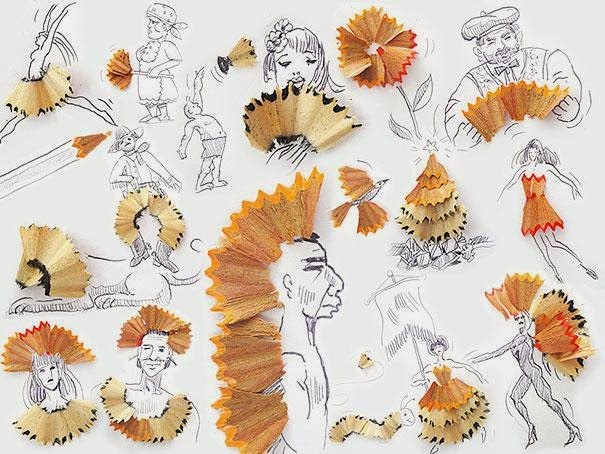 This is doodling raised to a high art form. This is like seeing a small, contained explosion of creativity right in front of my eyes. 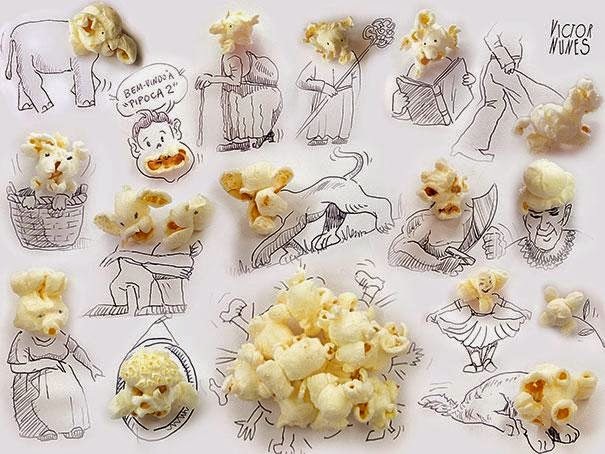 I love the mind that comes up with this stuff, evidently in a spirit of fun and whimsy. There's something to be said for whimsy… for art as play. I suppose art also has a serious vocation, but I suspect at bottom its main purpose is to teach us to see with new eyes. Maybe sometimes we go through life like sleepwalkers. I know I do. We see but don't perceive. Our eyes are turned inward, or set on some distant goal. And meanwhile, life in all its strange, kaleidoscopic beauty flickers by unseen. Or maybe we see some of what is there, but don't perceive the possibilities of what could be with just a small stretch or tweak or addition or subtraction. 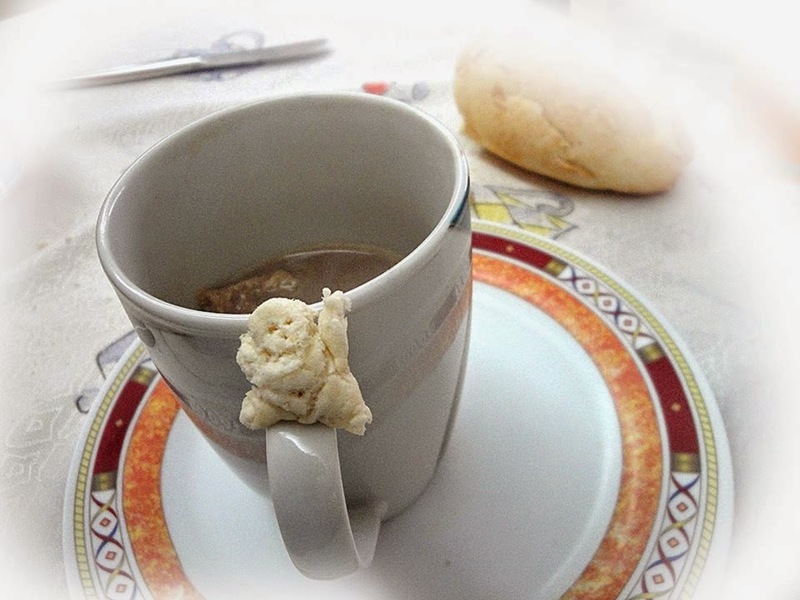 And along comes an inspired person with a little extra time on his hands, and he tinkers away with a wad of bread and suddenly it becomes a diminutive little being struggling to climb into his coffee cup for a morning bath of caffeine. As in art, so in life! I'm pretty sure I will be sleepwalking through my day tomorrow, but even so, I'd like to remember that one creative addition -- maybe a kind word, or a touch of humor -- can bring an unexpected light to daily life. Which drawing did you like the best? These are incredible! Thank you so much for sharing. I agree with you. Art has really trained me to see life in all perspectives and I am grateful for that. Hope you and your beautiful family are doing well!